Hungary and Czechia have now qualified for the finals in the Pandanet Go European Team Championship A league, joining Russia and Ukraine, who had previously qualified. This is the second consecutive trip to the league finals for Hungary and Czechia, while Russia and Ukraine have not missed a final yet, with Russia winning both previous titles. The European Team Championship (ETC), now in its third year, is comparable to the German Bundes League but with national teams from thirty European countries divided into three leagues. ETC games are played online using the Pandanet Internet Go Server. 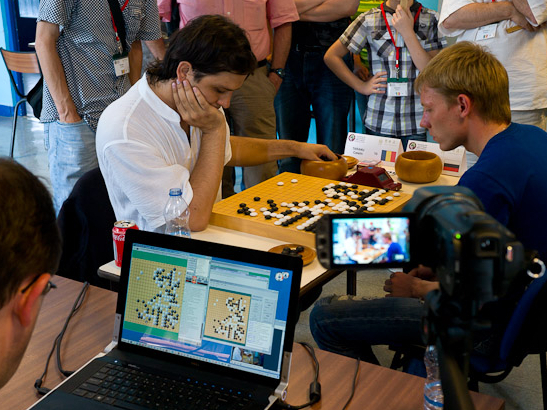 The top four teams in the A league are invited to compete for 10,000 Euros in the finals at the European Go Congress in Olsztyn, Poland in July, and up to five players per team receive support for their Congress travel costs. Two-time defending champions Russia may be tough to dethrone, with European professionals Alexander Dinerchtein and Svetlana Shikshina and three-time European Champion Ilya Shiksin heading up the roster. Last year, with no team gathering more than one match win, Russia had to rely on tiebreakers to retain the championship. Germany’s last-place finish means direct demotion to the B league for next season, while Israel, promoted to the A league last season, managed to reach 9th place and need to win a playoff match against Austria to stay league A. The B league team from Finland will be directly promoted to A league. UK will spend next season in League C, while 9th place Switzerland still hopes of staying in the B league through the playoff match. Their opponent will be Slovakia, Slovenia or Turkey. Slovakia will not leave one of the first two places so they get at least a shot at being promoted. The only team that can still pass them is Slovenia. Turkey must hope for Slovenia to struggle to get a chance in the playoff match against Switzerland. The last matches in the C League will be played on May 14th. All results will be available on the ECT tournament page.